Scottish architect, designer, and painter Charles Rennie Mackintosh (1868-1928) was one of the earliest pioneers of modern architecture and design, inspiring modernists across Europe with his bold new blend of simplicity and poetic detail.His avant-garde approach embraced a variety of media as well as fresh stylistic devices to incorporate into architecture, furniture, graphic design, landscapes, and flower studies. 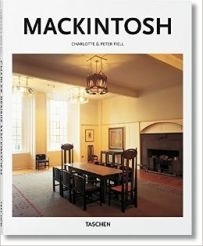 His preferences included bold black typography, restrained shapes, and tall, generous windows suffusing rooms with light.Mackintosh, along with his wife, artist Margaret Macdonald, made up half of the loose Glasgow collective 'The Four'.In this introductory book, we consider Mackintosh's practice across art, architecture, and design to explore his particular combinations of the statesque and sensual and its vital influence on modernist expression across Europe. Featured projects include his complete scheme for the Willow Tea Rooms and the Mackintosh Building at the Glasgow School of Art.